The Walt Disney Animation Studio hit it big when Frozen came out. It made $1.276 billion at the box office worldwide, making it the biggest animated film of all time. “Let It Go” became a viral sensation with people singing it everywhere. It’s a no-brainer for Disney to produce a sequel, and now it has released the teaser trailer for its sequel, Frozen 2. Audiences will get to see Elsa and the gang back for a whole new adventure. The teaser trailer features the return of Elsa, Anna, Kristoff, Olaf and Sven, and there’s an actual team now compared to the previous film where the sisters were separated for the most part. The beginning of the trailer features Elsa using her icy powers to run on the water. What’s she up to? Is she trying to hone her skills? Is there an island she’s trying to reach to? Either way, she fails when a giant wave comes crashing in, destroying the frozen water she created. The tone is really dark, but the waves and beach under the dark sky look breathtaking. It’s a nice contrast with a very stylized Elsa in a photorealistic background. Elsa is by herself in the beginning, but later on, she is joined by her sister, Anna, and the rest of the gang including Kristoff, Olaf and Sven. The group goes on an adventure to new lands, and the trailer ends with Anna grabbing Kristoff’s sword and slashing towards the camera. What’s this new threat they’re facing? A new character is introduced at the 1:25-second mark. Could they be voiced by Evan Rachel Wood? As for what audiences can expect, Kristen Bell, who voices Anna, talked about the character’s motivation. She then teases about the new characters that audiences will love. Frozen 2 features Kristen Bell as the voice of Anna, Idina Menzel as Elsa, Josh Gad as Olaf, and Jonathan Groff and Kristoff. Jennifer Lee and Chris Buck are back as the directors of the sequel. Frozen 2 hits theaters on November 22, 2019. 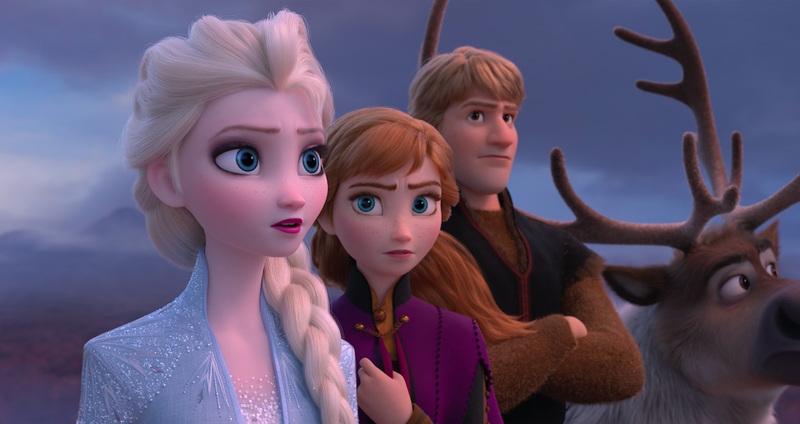 The post Elsa, Anna and the gang are back in Disney’s Frozen 2 teaser trailer appeared first on Nerd Reactor.